After my adventures with Kitty the other day, I decided on a solo mission for a higher DT cache was in order today. My target was Don’t Fall In! 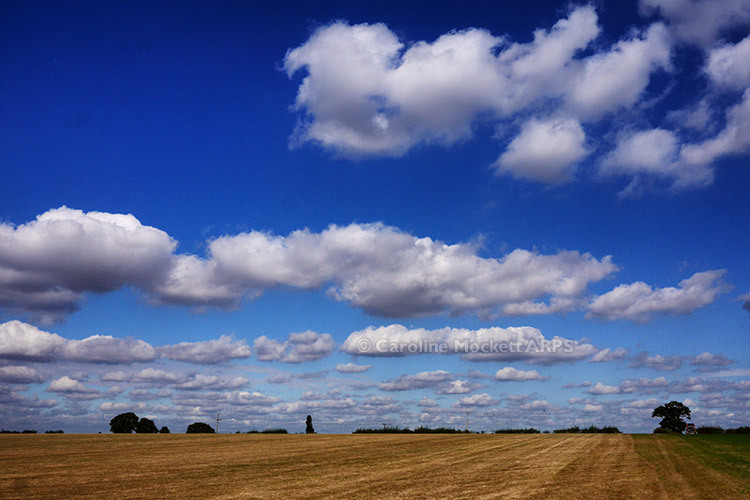 near Copford Green. 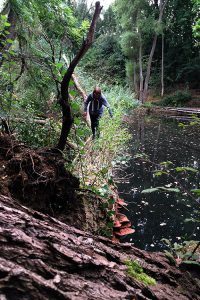 I arrived to find the pond was virtually dried up, but the cache was still tricky to reach. Dried Up But Still Tricky! After a bit of manoeuvring I finally got my paws on the log – and another D4/T4.5 pot was under my belt! It took a bit longer to accomplish than I had hoped, so I was a bit late arriving for BEASTMARSTA‘s GeoCoffeeClub#15 in the Old Heath area of Colchester. 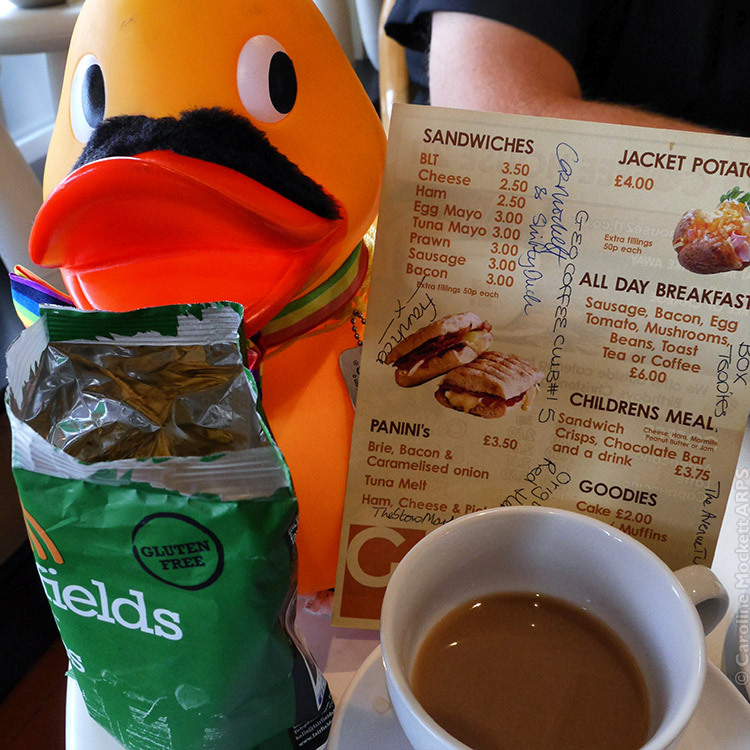 Shifty quickly made a start on the crisps! 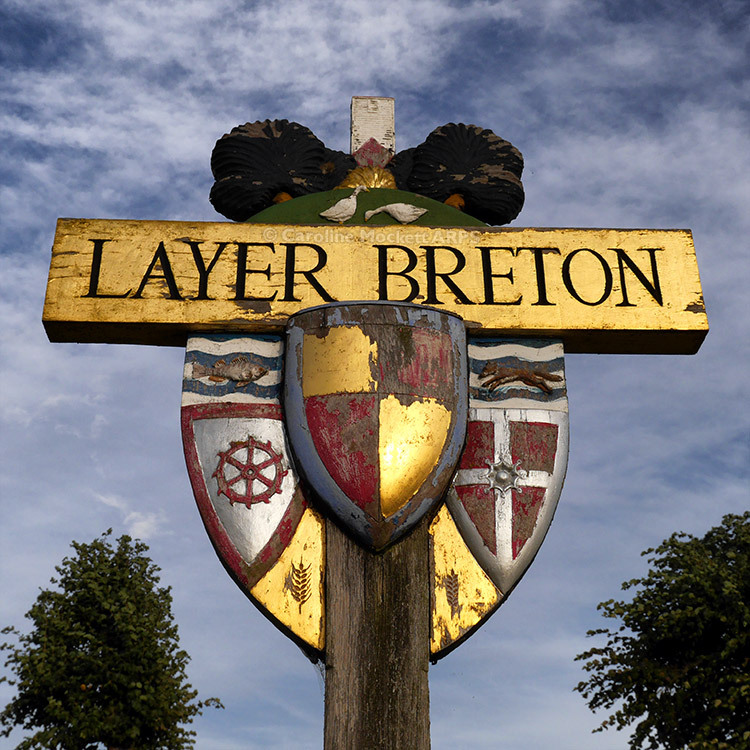 Suitably fortified, I then headed back to Birch and Layer Breton for a circular walk taking in lots of trads. 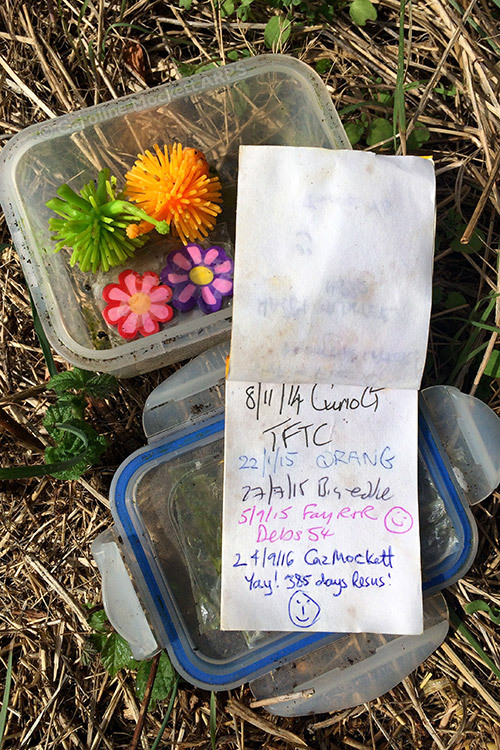 A mixed bag of success – plenty of finds but a few frustrating DNFs too. This alien was a nice quick find though! When I’m out and about I do like photographing the Village Signs – Layer Breton is clearly very posh, they have gold leaf on their sign! 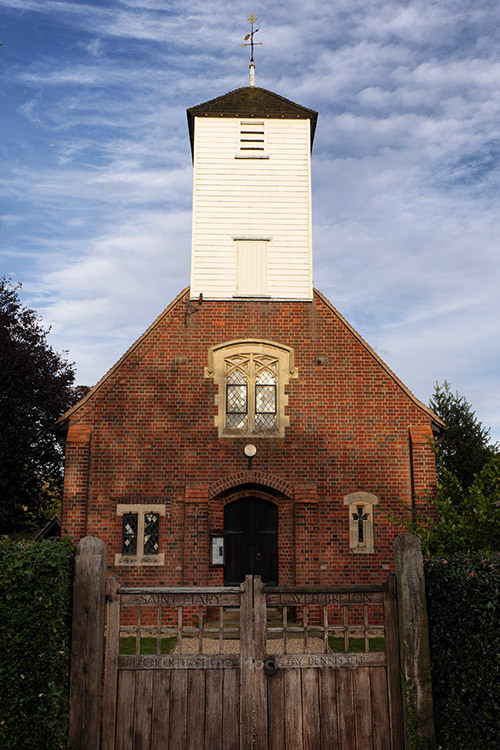 They have a quaint little church in the village too. 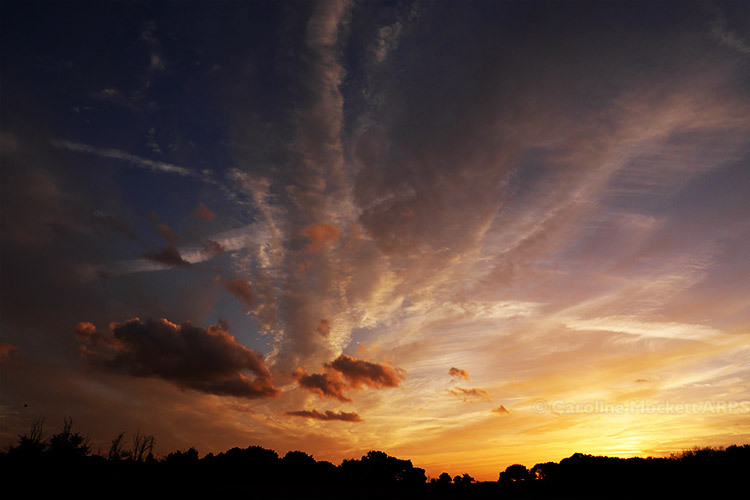 It was getting dark by the time I had finished my loop – the sunset was rather colourful tonight. 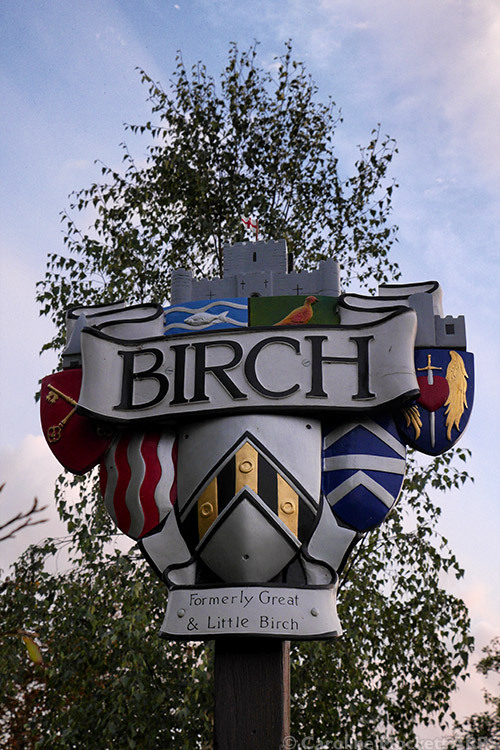 After finding the Village Sign cache (it was quite a walk in the gloom to GZ) then finally back to the car in Birch, I was grateful for a sit down before the drive home. 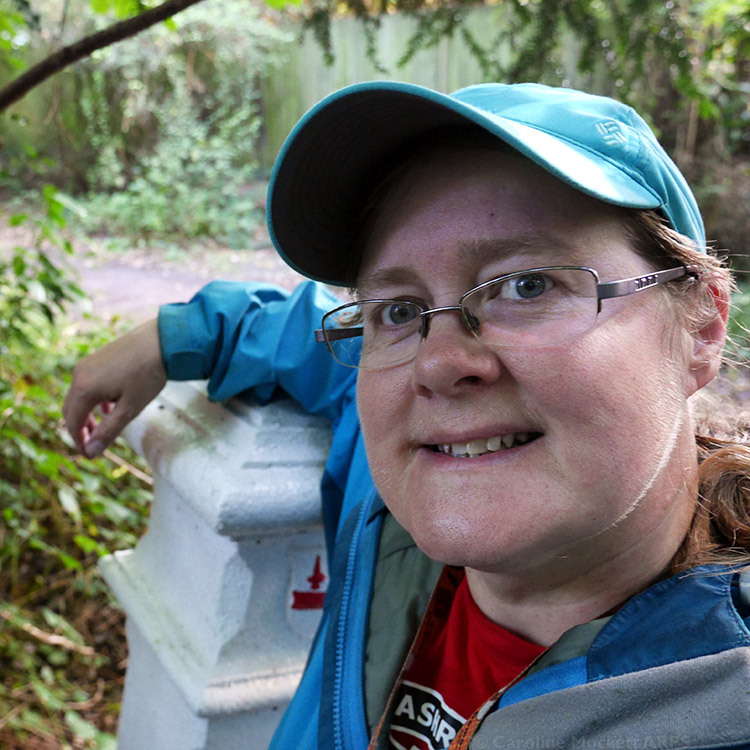 I just had time for a quick cache on the way home from work this evening. My target was Cambridge Circus, London – Tinker Tailor Spy. 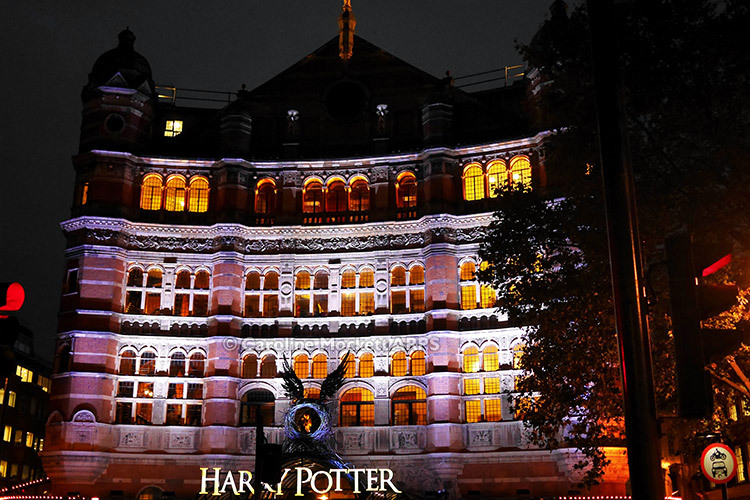 Its location is opposite the Cambridge Theatre, where the sold-out Harry Potter show is on for months. The place was crawling with muggles, but sometimes you can use that to your advantage. Standing on the corner pretending to look at my phone, I didn’t look too out of place. Having waited for a little while before making my move, I signed and replaced without incident. 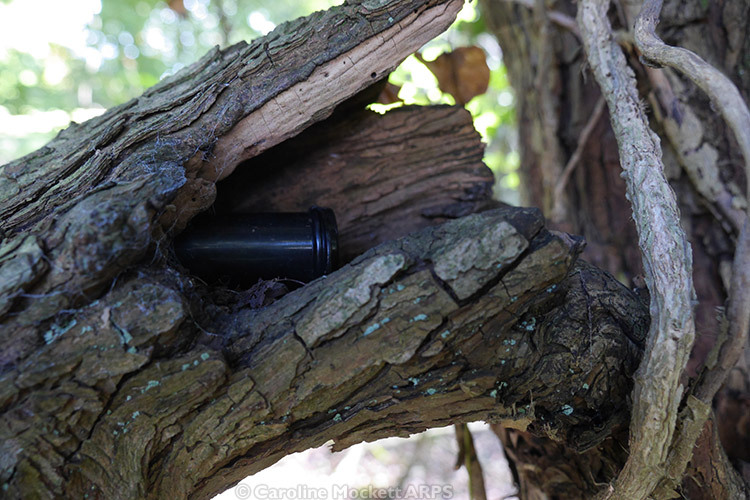 Perfect Urban Stealth caching! Kitty and I may be ladies who are approaching a certain age, but we’re not beyond having a little adventure from time to time. 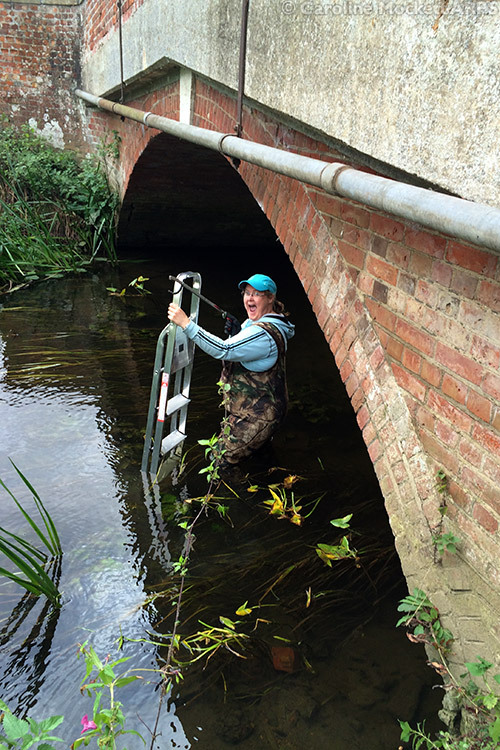 Today as Kitty’s birthday, and we had earmarked a few highter DT caches to have a got it – either with a ladder or our waders. 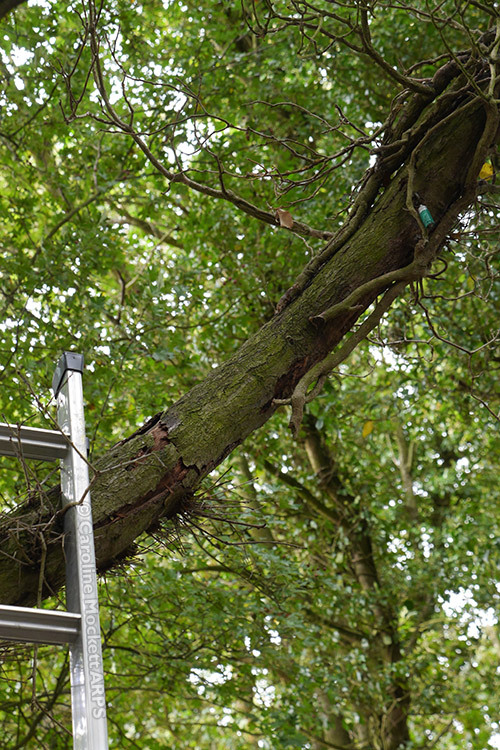 With an aggregate age of 100, the pair of us decided that pure tree climbs were rather too much for us, so we came “tooled up” and ready to scale new heights. 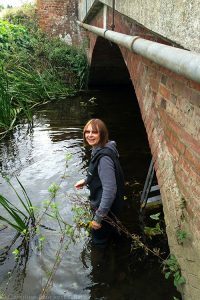 This D5/T5 was soon in the bag – and we replaced a soggy log while we were about it. Bouyed by our success, we headed to the next target with renewed vigour. 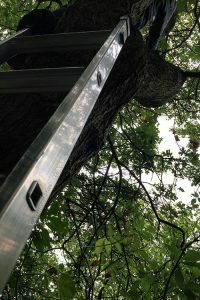 This time it was my turn to go up the tree. Undoing the pot one-handed was OK but doing it up again was rather tricky! We had scouted out Do Look Down!! 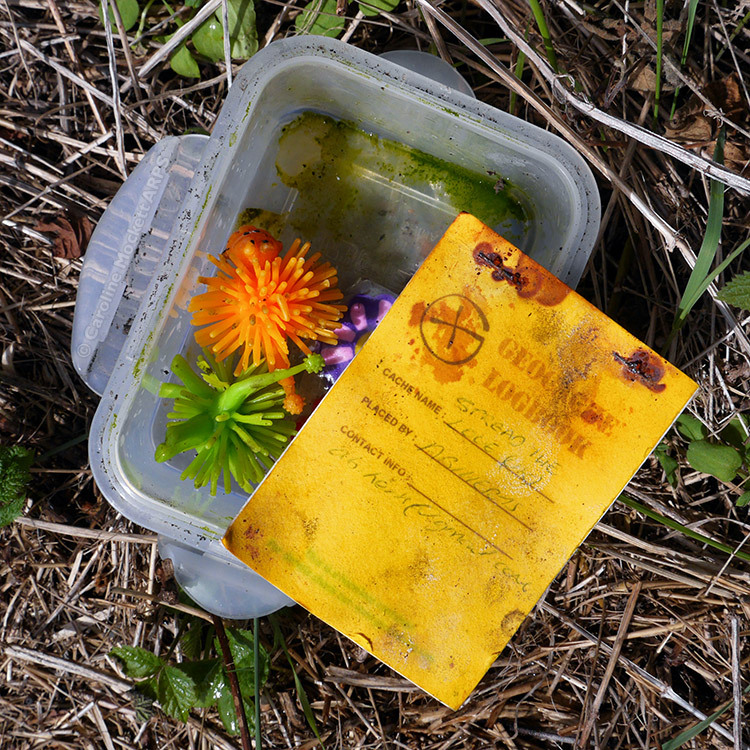 !, a wading cache, a few weeks ago but didn’t have our gear with us. So we came well prepared today. Kitty went in first to grab the cache, then it was my turn to put it back again. Marvellous! Job done. 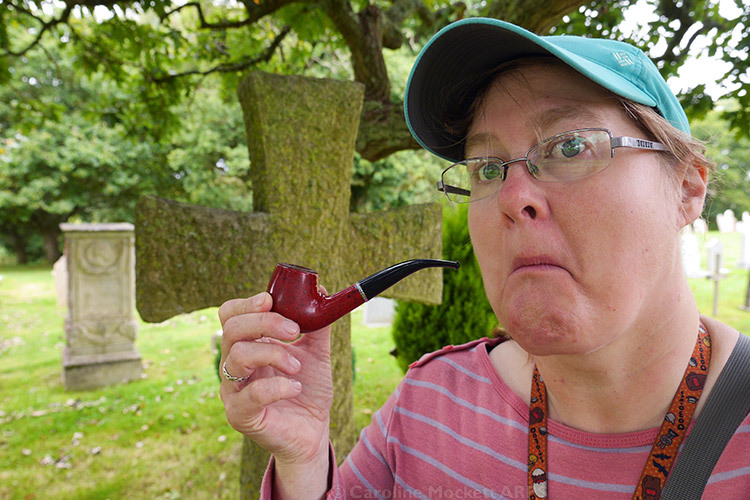 I’m looking rather pleased with myself to have bagged this D2.5/D4.5 pot! Our final location was around an old gravel pit at Bradwell. I had had a little trad on my GPS for ages, which I picked up quickly on the way – only to discover when I got home that it had been archived the day before due to a non-responsive CO to maintenance! Ah well, it’s still there. Then we walked around to the main attraction. Gone Fishing!! 4. The GPS was all over the place around GZ but we hacked our way through lots of brambles and eventually got to somewhere which fitted the hints. Kitty gamely walked the plank. I wasn’t going anywhere near it. But to no avail. 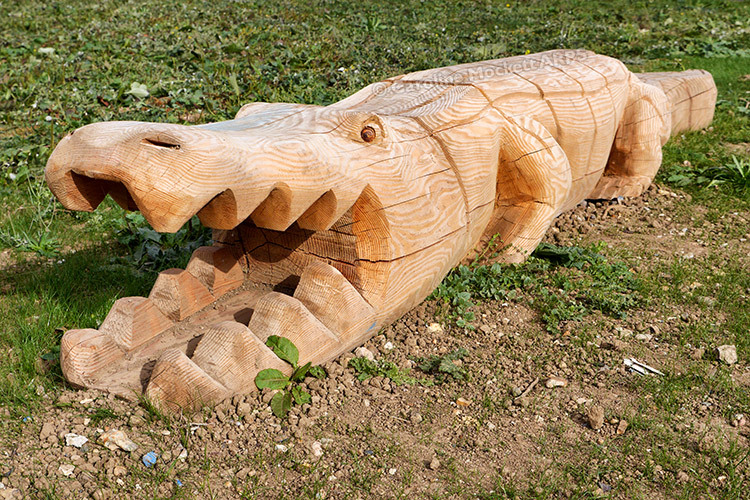 We scouted another one, much thinner and more feeble, but decided that couldn’t be it. On reflection, it probably was, but neither of us was keen to teeter out on that one, with the evil-looking black gloop below. Hmmm. Might have to give up on this one after all! It was a disappointing end to the outing, but we know our limits! 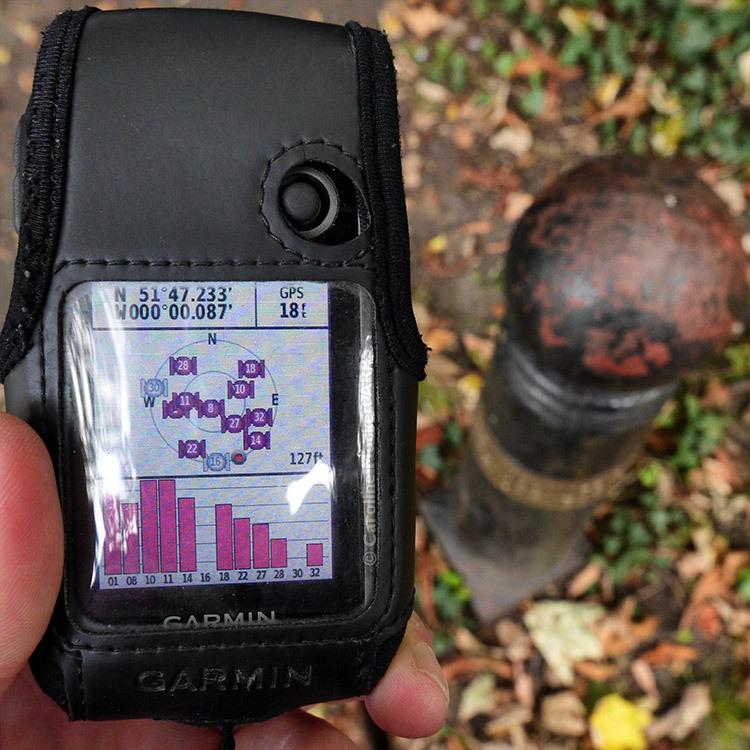 I’d had the Coal Post Challenge on my radar for some time (find 6 consecutively-numbered Coal Post caches). 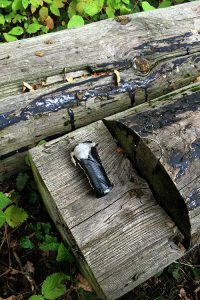 But having done some research, many of the original caches have now been archived, and I could only spot a run of 7 still active around Reigate in Surrey. 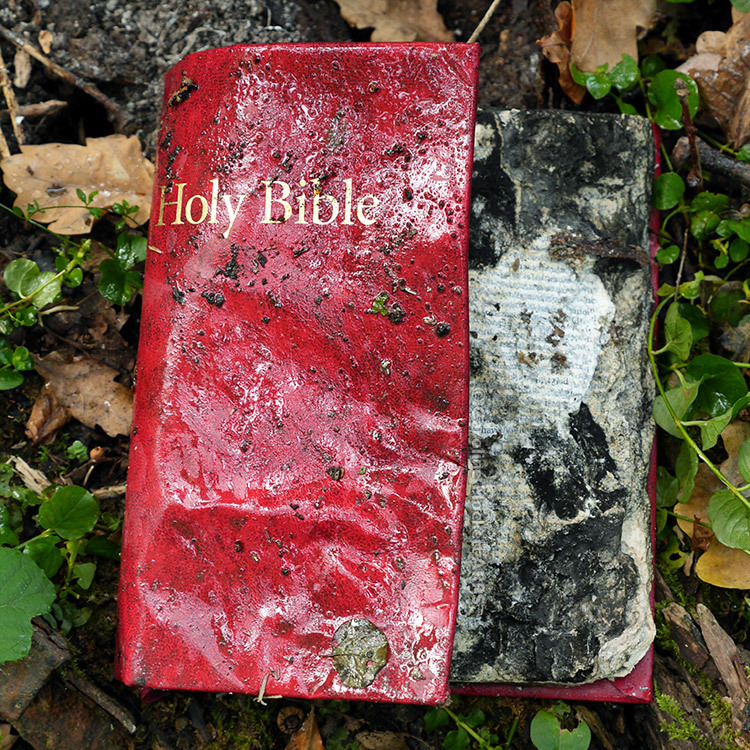 That’s a bit out of my normal caching zone, but when I noticed a CITO had been published close by for today, I decided a road trip was in order, to kill several birds with one lump of coal! 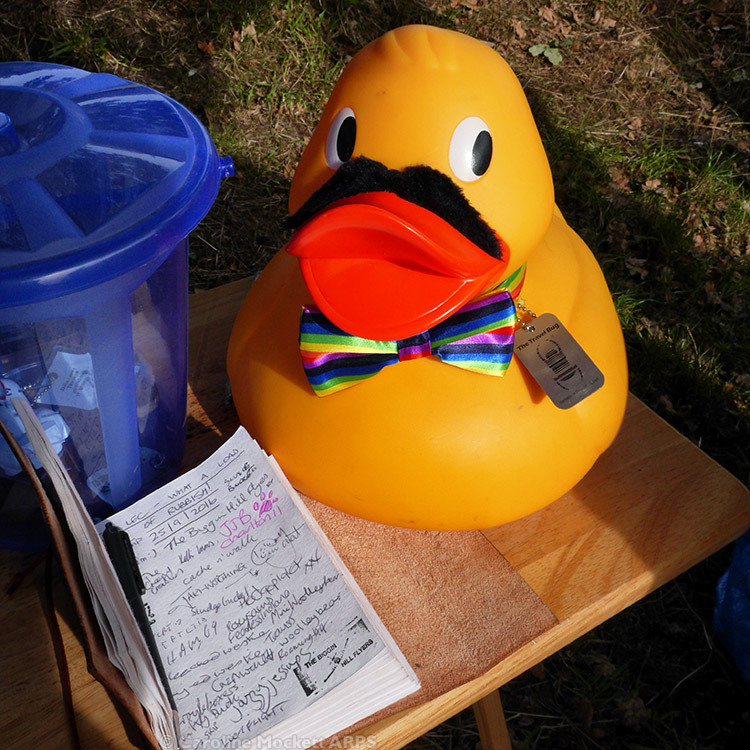 Of course, Shifty Duck made sure he signed the log, and was ready for people to discover his TB code, along with the ever-helpful Larry The Litterpicker. We gathered up quite a lot of stuff! Great to see such a good turn out. 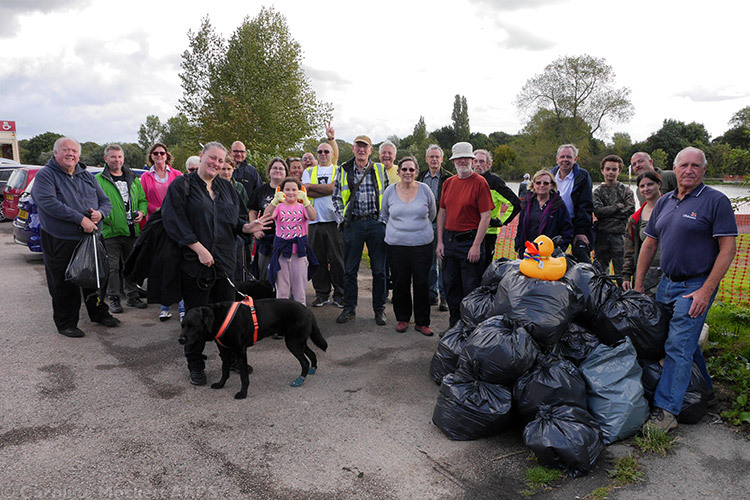 Lots Of Cachers, Lots Of Rubbish! Having scoffed a tasty bacon sandwich from the car park snack bar, I set off to find the other hides I came for. The first of them was the newly-replaced Reigate TB Hotel. Great box! 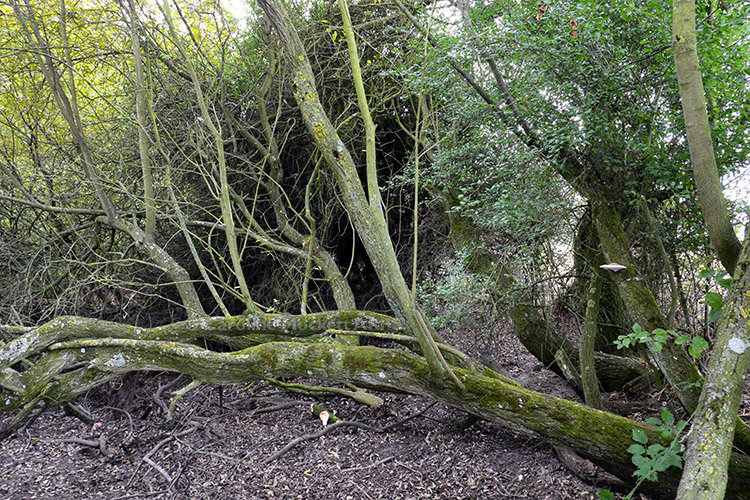 I had a frustrating DNF at a Letterbox hide nearby, which others don’t seem to have had any trouble with. Damn. Never mind, I really came for Coal Posts! 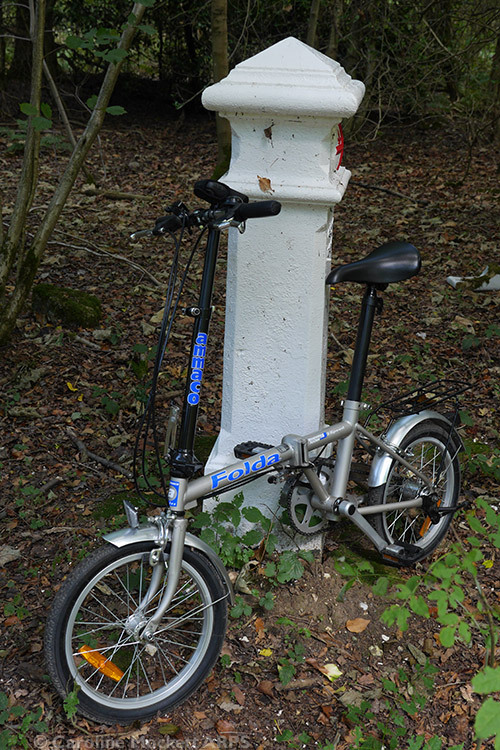 So I moved the car to somewhere convenient and unfolded the geo-bike for my ride along the bridleway between Kingswood Warren and Colley Hill. The bike made my progress much quicker! I was aiming for posts 149-155, and luckily found them all quickly, apart from one, which took a bit longer. Even this tricky whatsit didn’t fool me! 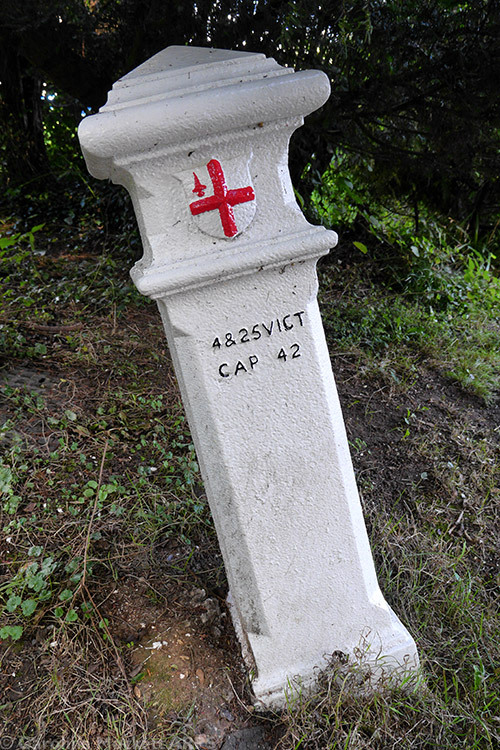 So, with 7 posts already under my belt, I decided to stop off at the Challenge Cache itself (Coal Post 206), which is conveniently just off the M25 at Swanley, not much of a detour on the way home! Job done. 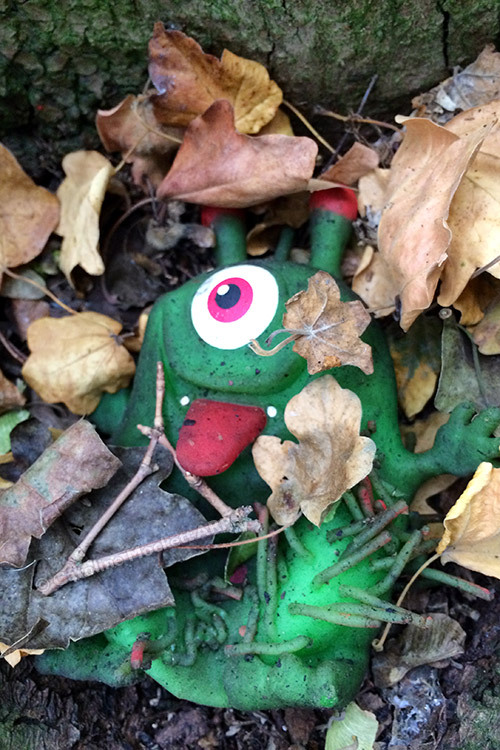 But, there was another Coal Post cache just half a Km away, so why not pick up stumpy No. 203 too, while I’m here? 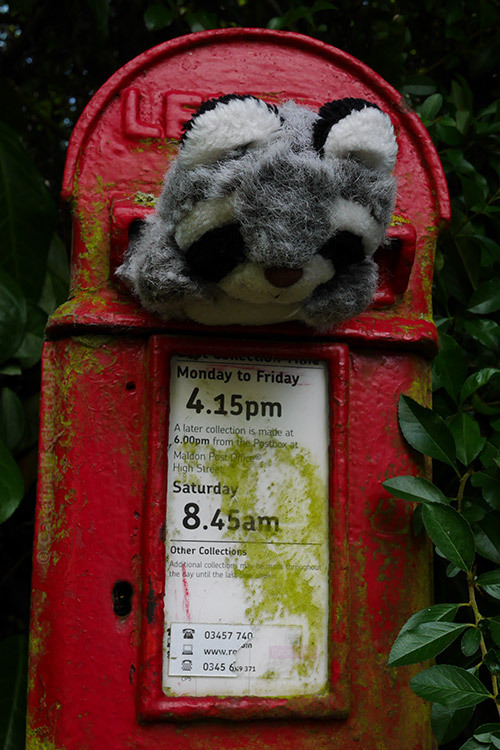 That makes 9 Coal Post today – hurrah! 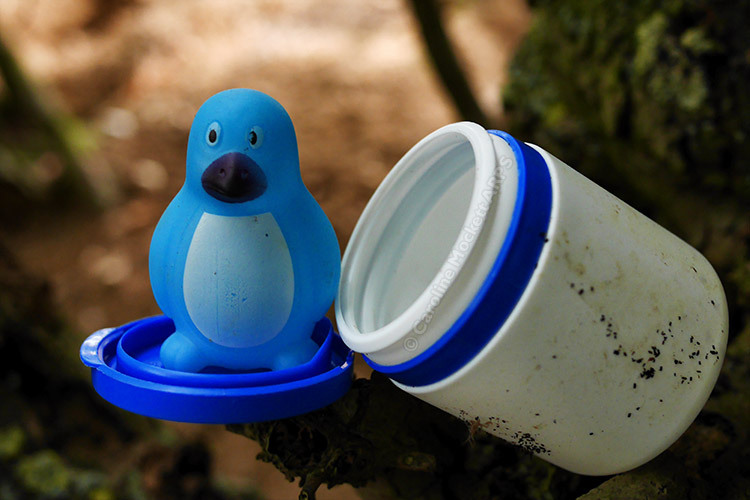 Today’s outing was a brief solo foray into Hertfordshire to pick up some caches around Amwell, followed by a nice walk around Tiptree Heath back in Essex with geo-buddy Kitty. 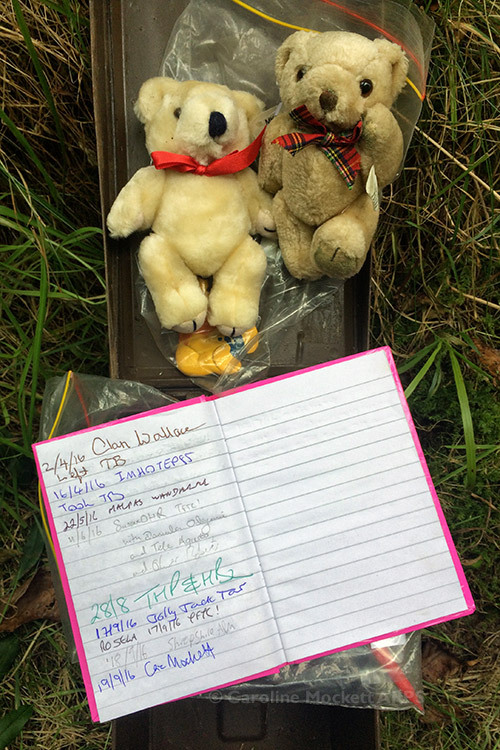 My first target in Amwell was a Challenge cache, Spread the Love Challenge (UK) all about resuscitating unloved caches which haven’t been found for over a year. 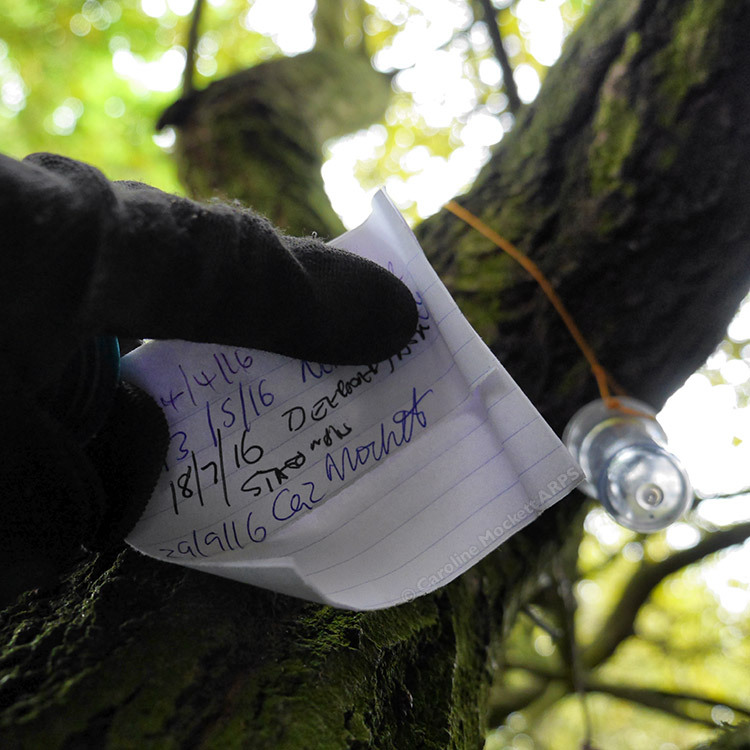 Well I qualified easily enough, but also noted that this cache itself had been unfound since 5th September 2015, even though someone had tried in the interim. Challenge Accepted! 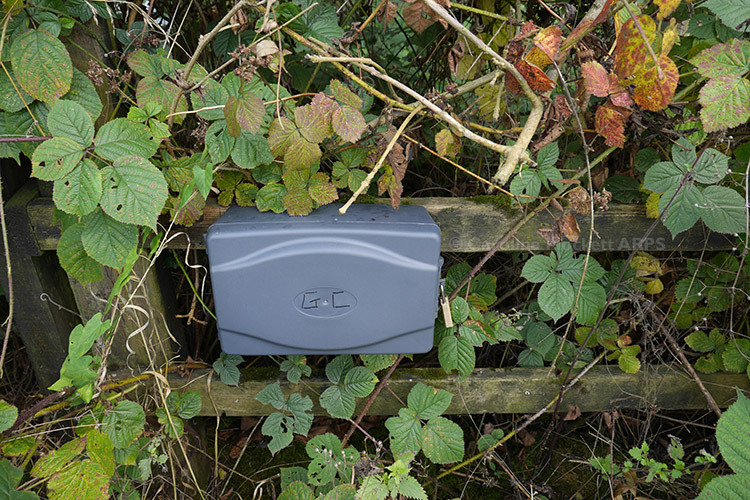 I wandered around for ages and eventually found the box, very sorry for itself, a little way from the co-ords and only just as described by the hint. The contents were pretty soggy. However, I unfolded the log and was delighted to find nobody else had signed the book since the last recorded find online – so I had just managed to Resuscitate The Resuscitator Cache! Do I get extra points for that? Since I was in the area, and there were some other interesting caches nearby, I made it a little circular walk to pick up a few more. 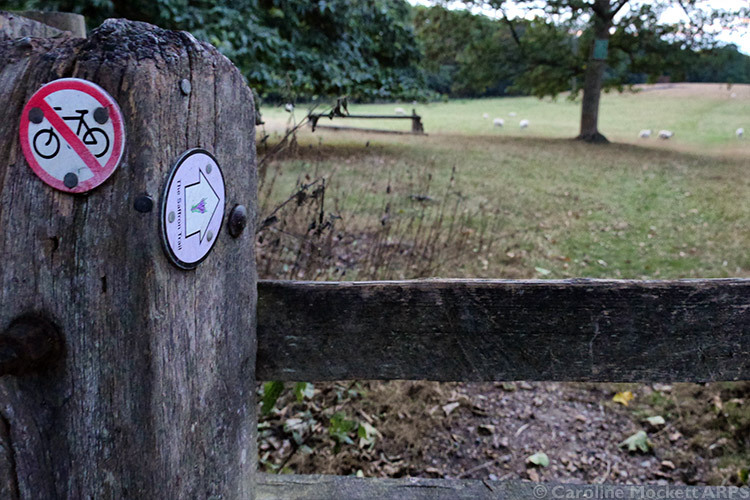 The next one was placed close to the marker for the Greenwich Meridian – but the GPS seemed to think this was a little way off the correct location for E/W 0° 00.000! 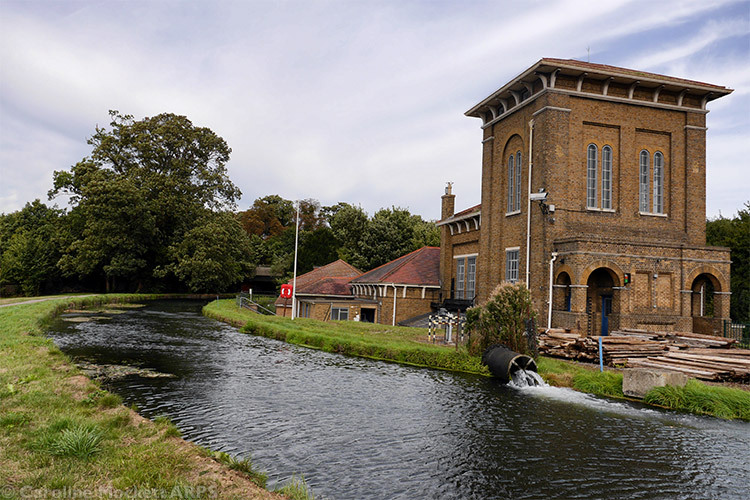 There was a bit of fine industrial architecture too; the old Victorian Pumping Station along the New River. 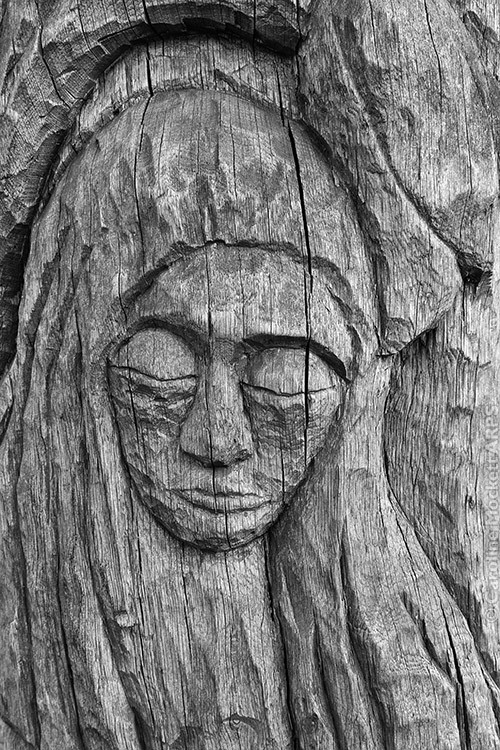 Having finished my walk in Herts, I had a rendez-vous planned with Kitty in Tiptree Heath, to search out a quartet of Mr Crow’s puzzles relating to the tree carvings in the area. There were some great examples. Not sure this lady wanted to be disturbed though! 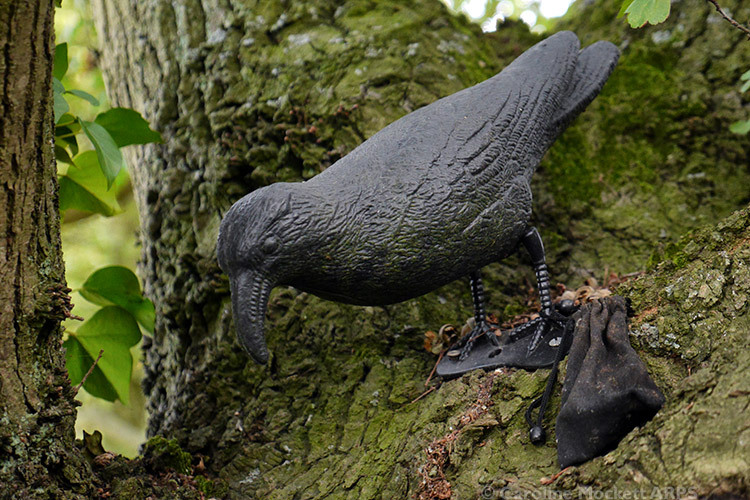 Talking of Crows – Corvus plasticus was guarding one of his other puzzles which we had also solved. With the aid of a ladder we had in the car, we soon made quick work of finding the pot and wresting it from the avian beak! Our final port of call this evening was Sing It Again Rod (Encour), an audio conundrum by Fenners1984. We had both had a hand in solving it, so a joint find was a nice way to round off our outing. 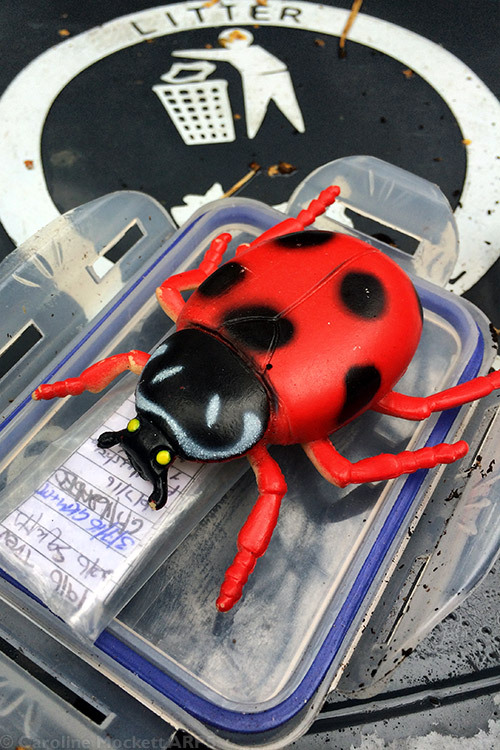 There was just time for a brace of caches in Danbury this evening after running errands nearby. Having been too busy gassing to collect these two the other night when the Essex Meet was held, I thought I would have a look today. A couple of nice quick finds. The sheep ignored me! 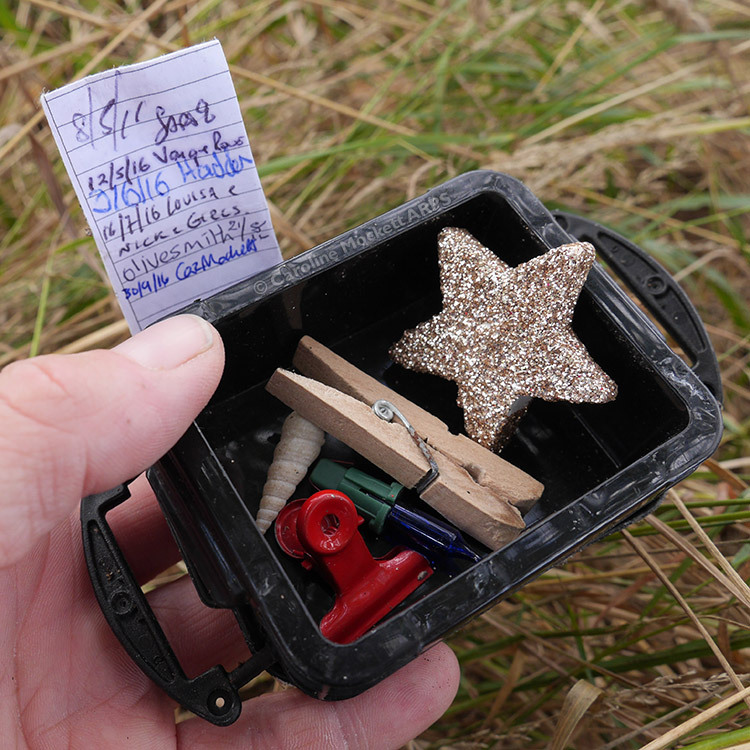 It was my last day in Hampshire and Dorset today, so I made the most of it by running round like a mad thing picking up the last caches which were on my list – a mixture of virtuals, challenges and a few others as I was passing. I started off heading further south west, to pick up a D1/T4 Loop 2 grid filler, The Bear Necessities Of Life. There were even bears inside! Awesome. 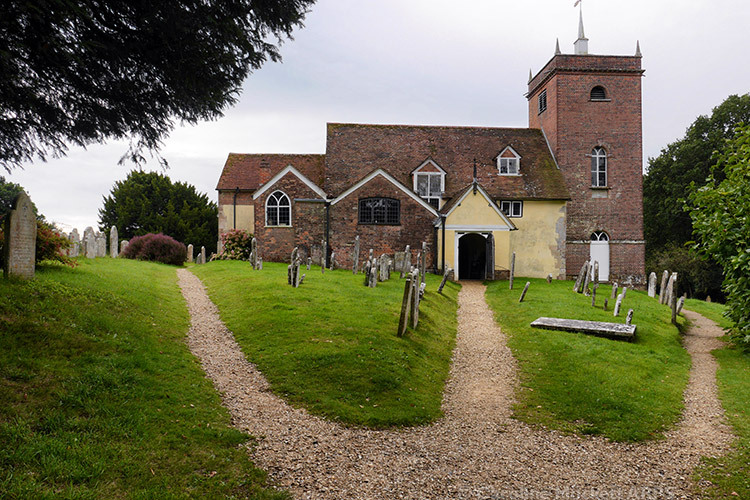 Next I headed to Minstead Church, situated in a quiet village just off the busy A31. I was looking for a Virtual cache dedicated to the author of a famous Detective. Can you guess who? 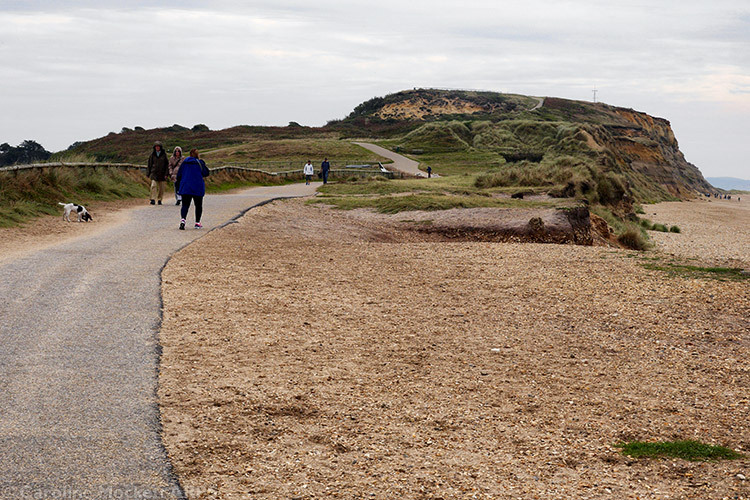 Next I headed for another Virtual, this time on Hengistbury Head, an outcrop of rock overlooking Christchurch Harbour. Just as I got out of the car, it started raining! Drat. 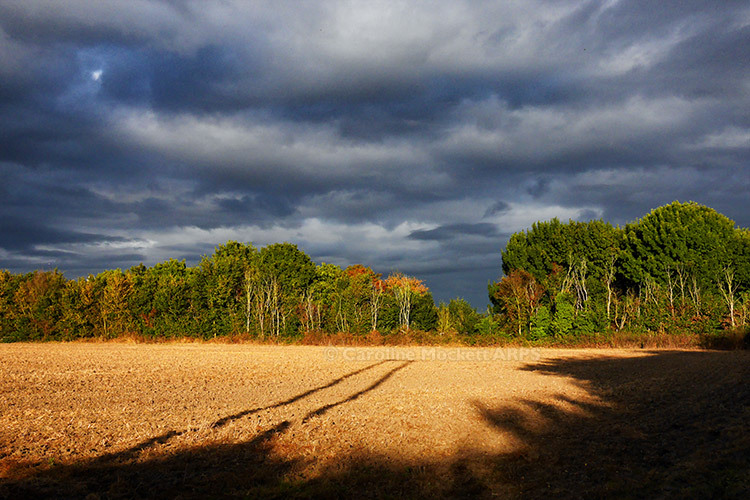 The rain continued, on and off, for much of the day. 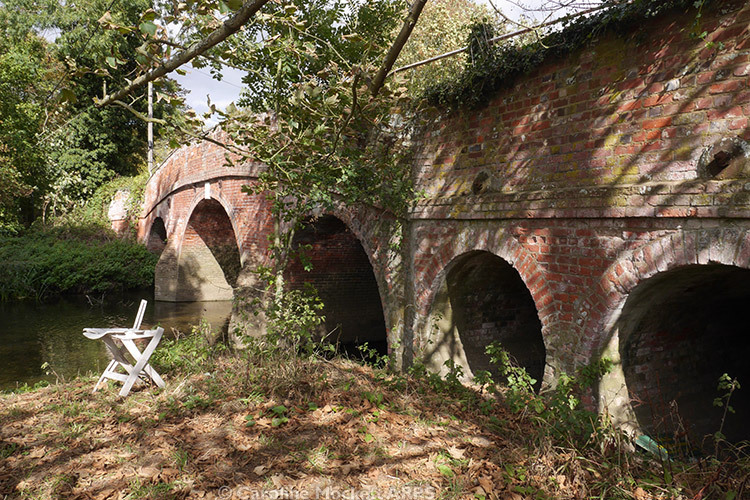 I also enjoyed locating several trads and Challenge Caches along the route of the old railway between Upton and Broadstone, north east of Poole. 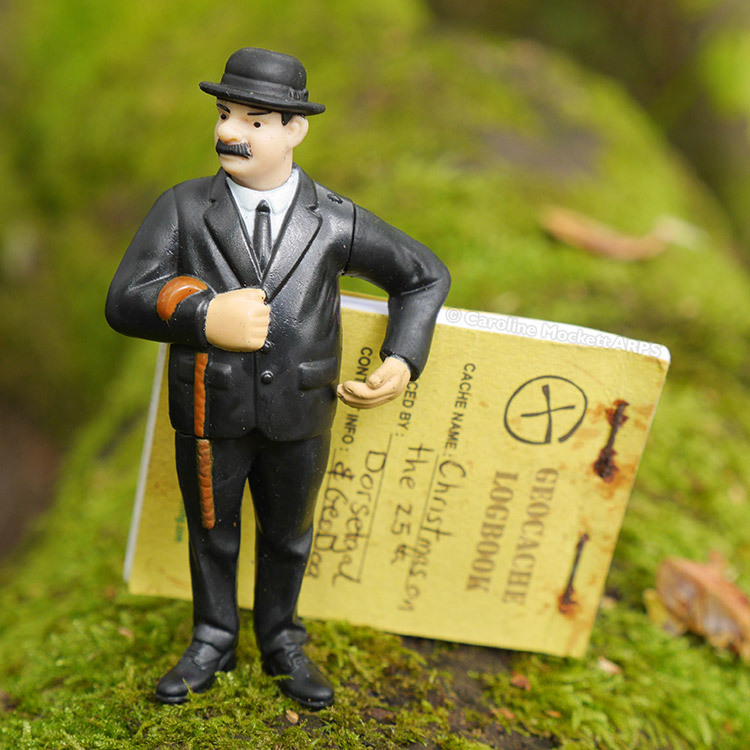 I was particularly pleased so spot The Fat Controller – or perhaps he is a frustrated commuter – in one of the caches. Other wildlife spotted included this huge red beetle! Thankfully, it was just plastic. 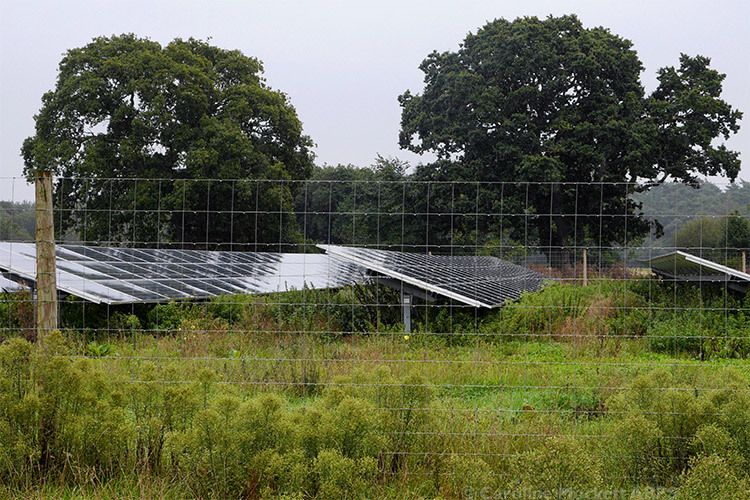 The irony of walking past a solar farm in the pouring rain is not lost on me! By this time I was east of Ferndown looking for a trio of Challenges by DizzyPair. 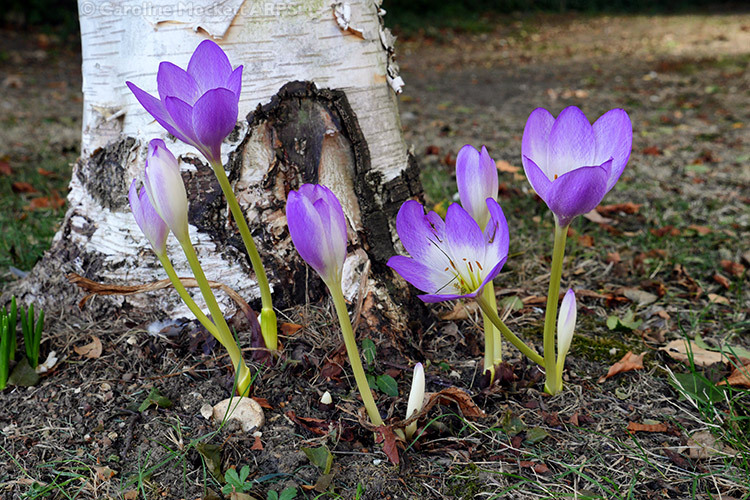 There are one or two more in the area which I don’t yet qualify for, so perhaps I will be back on a sunny day sometime! 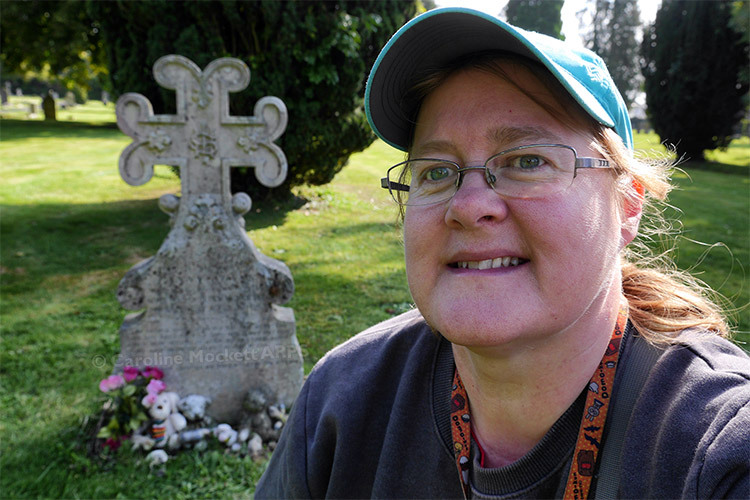 My final find, as it turned out, was another Virtual at Florence Nightingale’s Grave. Here I am, posing under a brolly! As if I wasn’t already wet enough, I decided to attempt another grid filler – this time a D2.5/T4.5. 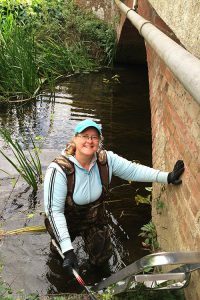 I even donned my waders, but the cache was out of reach and I didn’t feel it was safe to go climbing on my own, so I left it be – it’s only a cache! It was a rather soggy drive back home, but I had a great 4 days finding some unusual stuff in an area I don’t get to very often. A grand road trip! 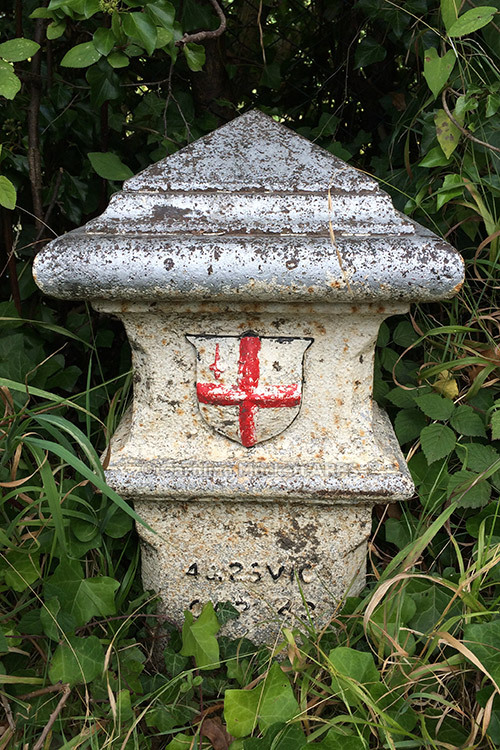 I have been staying in Alton over the past couple of nights, and had noticed there was a Virtual Cache in the cemetery nearby. 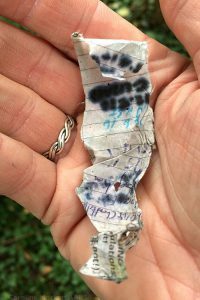 So this morning, it was the first cache on my list. Sweet Fanny Adams was found quickly in her resting place – it took longer to park the car! 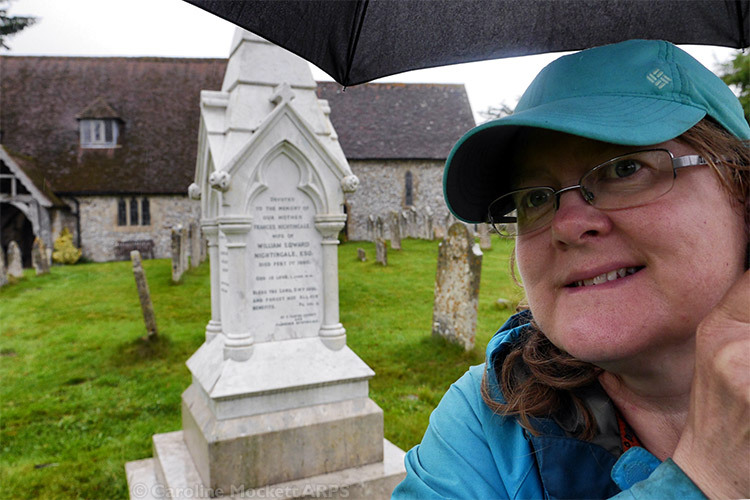 I then headed off to pick up some more Challenge caches around East Tisted and East Meon. 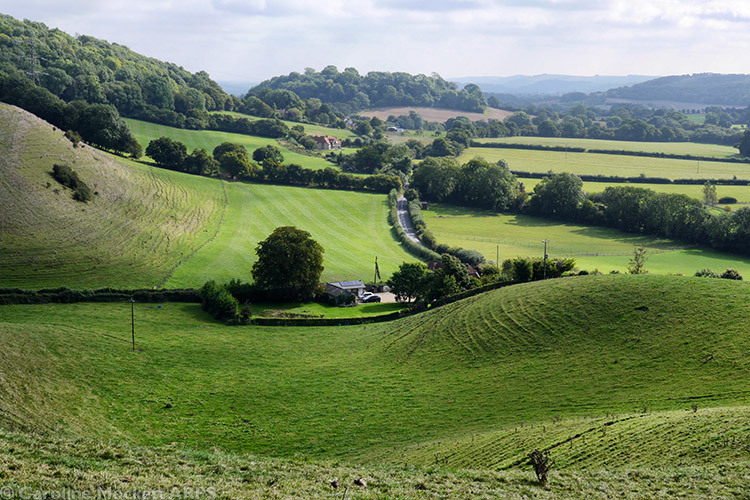 The countryside is quite bumpy around here! Having done that, I headed to Liphook to meet my muggle friends for the birthday event during the afternoon, at the Hollycombe Steam Collection, followed by a curry in the town. It wasn’t really dark when we wrapped up, so I took a little wander around Liphook itself to find a handful more, before finally heading back to my hotel for the night.